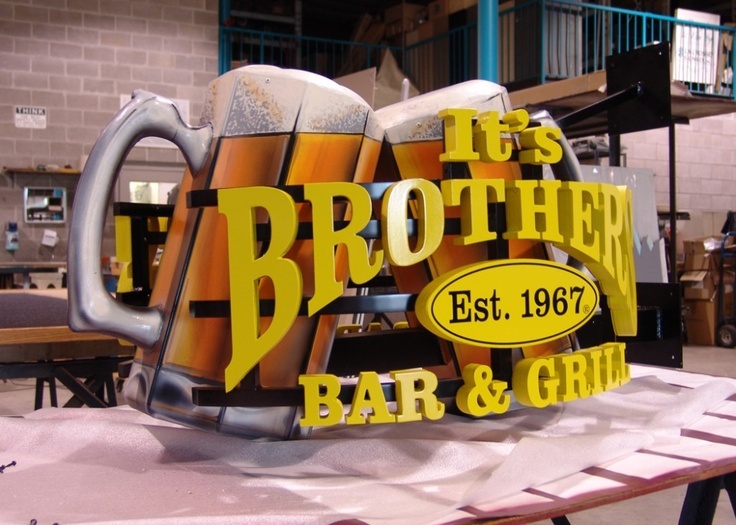 There are a lot of factors that go into the making of the best restaurant sign designs. A well-designed restaurant sign can be one of the best advertising tools for any restaurant. Some of the factors that go into the making of a high-quality sign design, include the sign’s focus, size, attractiveness and more. We’ve seen and created a ton of restaurant signs in our time and in this article we’d like to present you with what we believe are our top 5 restaurant sign designs. If you’re interested in making your own best restaurant sign design, contact us at Westmount Signs and Printing to see how we can help. We have wonderful designers on staff that can help you to create a one of a kind sign at a great rate. Click here to contact us today! Without further ado here is our list of our favourite top 5 restaurant signs. We hope you enjoy them! We really like this sign because of its simplicity and effectiveness. Sometimes the simplest designs are actually the most effective and Mel’s Diner is a great example of this. The sign is easy to spot, even at night, and the contrasting red on white make it easy to read and understand. What makes it unique is its retro neon look, but is actually LED with channel letters. While there are other restaurant signs similar to this we could have chosen, we feel that Mel’s Diner does an outstanding job of making a sign look clean and professional. Sure the sign at Rae’s Restaurant in Santa Monica may be old but we think it’s a classic design that does a particularly good job at drawing in customers of all ages. During the day it stands up high on the street side, poking out for all customers, but at night, its neon lights light up making it very noticeable. Retro signs like this one are great for drawing in older customers who are looking for more traditional food, and younger customers who are looking for a unique experience. Though because of their safety hazard we no longer suggest the usage of neon lights for your signs, at Westmount Signs we are able to provide you with some fantastic backlit sign designs. This sign for Nana’s Irish Pub in Oregon is one of the coolest street signs we’ve ever come across. It is well designed, using traditional Irish greens and golds and classic Celtic art. This sign is sure to drive in customers who are longing for some Irish pub food. We love that they decided to go with a more classic tavern style sign as it gives Nana’s a more “at home” feel, which is something many pub goer’s look for. This is a really cool sign design. The things we love about it is that it’s very focused and simple, anyone who looks at this sign knows they can get a beer here. We also love the usage of bright colours, such as yellow, which can help to draw attention. Add in the fact that this sign is fairly large and we’re certain that it’ll help bring in a ton of customers for their business. 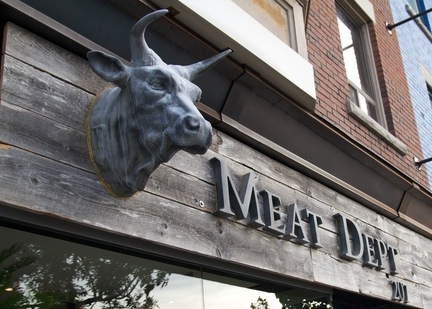 Located in Toronto, Ontario, the Meat Department has become one of the areas premier butcher shops and their sign is nothing short of fantastic. We love that they chose to use a more rustic look for their sign because it helps to give the shop an immediate traditional feel. The focal point of the sign is clearly the bull sticking out of the front of the sign which leaves no doubt about which products they sell. What’s most impressive is the amount of detail that’s clearly been put into the sign, particularly the bull head. We find this leads you to feel that this business is all about detail and perfection which is what you want from people who deal with your food. We hope you’ve enjoyed our choices for some of the best restaurant signs. Our company, Westmount Signs and Printing, is located in the Kitchener-Waterloo region and we provide high-quality signage and printing services for businesses in and around the area, including restaurant signage but that’s only one of our many products and services. We also offer other kinds of exterior and interior signs, digital printing, vehicle graphics and our own installation and maintenance service. If you would like to learn more about us or get started on a project, feel free to call us at 519-885-1400 or email us at sales@westmountsigns.com! Click here to learn more about Westmount Signs! Click here to see some of our previous work! Click here to see why we offer the best value around! Do you have a business? What makes your business work? In this article, we are going to discuss the importance of having an outdoor business sign by looking at its benefits, uses and the different types available. Westmount Signs is dedicated to providing the Kitchener-Waterloo region with high-quality signs and printing for business or other purposes. If you would like to learn more about us or would like to get started on a project, feel free to contact us! Outdoor Business Signs are able to attract attention like no other marketing strategies. They are customizable to suit your business’ style and needs, they can help to decorate your property, and most importantly, they create a strong impression for customers. An outdoor business sign is the first step to creating a sturdy business since it acts (sometimes literally) as a doorway for your customers to experience your services. Outdoor signs can act as anything from landmarks and information booths and still help boost your business. Of all the types of signage at your disposal, outdoor business signs should be the number one concern for you. Their wide reach and helpfulness to others is unparalleled when compared to any other kind of sign. Click here to see a quick guide to signage to help decide which sign is right for you! In choosing an outdoor sign you have two options: storefront signs or roadside signs. Each can be customized with lighting to allow night advertising. For a full list of our signage options, click here. If a customer is looking for your location, a storefront sign will help direct them to the right building. Signs that are directly attached to the front of your store can be lit for night advertising or left as they are depending on whether your location and type of business would make this possible or beneficial. Individual cut letters are by far the most appealing signage option and can be lit in several different ways. Click here to read more about how they work! Variations on this type of sign can be implemented to give your business whatever it needs most. A roadside sign’s main job is to advertise. Many businesses will use a roadside sign to display messages for their customers, such as hours of operation, special offers, events, and contact information. This signage can be electronic or a reader boards. A freestanding sign without additional text can be illuminated at night with LED lights to draw attention. Illuminated roadside signs are especially useful if your business’ building is located far away from the main roads or other businesses. In this regard, it can be likened to a beacon for customers! Westmount Signs is located in the Kitchener-Waterloo region. We provide high-quality signage and printing services in and around the region for business and recreational purposes alike. While outdoor business signs are a part of our services, we also offer interior signs, digital printing, vehicle graphics and our own maintenance and installation service to ensure your satisfaction. We are known across the region for our quick turnaround times and flexibility. If you are worried about how a project will turn out, we can provide free mock-ups to make sure you’re getting the right result. If you would like to learn more about us or would like to get started on a project, call us at 519-885-1400 or email us at sales@westmountsigns.com. Outdoor business signs are by far the best way to boost your business. They are visible, striking, unique and they last for a long time. Despite their inherent advertising value, outdoor signs can sometimes be used in ineffective ways, damaging their business. In this article we will talk about what the most common types of outdoor signage are, as well as what type of signage should be used for your business. Westmount Signs and Printing has created a handy how-to for all your outdoor business sign needs so you can use them effectively! If you would like to learn more about our services and products or would like to get started on a project, feel free to contact us! Outdoor business signs vary depending on their location, size, and purpose. can click here to learn more about backlit signs or here to learn about LED signs. Electronic signs may also be a good option if your business often has specific messages to be advertised. If you are in an area with adequate lighting already, consider installing an unlit, or traditional sign. These are practical and considerably cheaper than a lit sign. Traditional signs can be reader boards or A-frame signs. If you are in a plaza, make it a priority to install your business’ sign in the pylon sign typical in those areas. A storefront sign is any sign attached to your building. These types of signs will typically be laid above your business’ entrance and can vary in style. Individual cut letter signs are extremely popular right now since they incorporate the modern minimalist look. They can also be installed with LED lighting so the letters will be visible at night. Banners are another, less permanent option, and help to advertise relevant temporary information to your customers such as sales events or changes being made to your building. Above anything else, always have a storefront sign. It is the most basic advertising since it is directly connected to your store and helps others identify where you are located. Click here if you would like to read more about our amazing exterior business sign selection! Drawing attention to a small property can be tough. When you are considering signage, always go for an overhead storefront sign. This will draw attention to you building’s exterior. For a more effective sign, use individual cut letters (logo permitting). Creating a minimalist sign is an excellent way to appeal to customers since it is modern and stylistic. You can also install a backlit or pylon sign on the edge of your property to attract customers from the road. Choose a respectable size, since the sign could outweigh your property if you are not careful. Always be sure to include your business on a pylon sign. This will better the chances of someone finding your store. Pylon signs are a battleground for recognition so make sure your business comes out on top. Click here to learn more about effective logo designs to help you achieve the perfect logo for you. Plazas do not allow for much leeway in the types of signs you can use but go for something that fills the space you have been given for an overhead sign. Doing so will attract attention. If you would like to advertise more current specific information such as sales or events, consider setting up an a-frame sign outside your store. Passersby’s will be able to read it as they approach your store. Businesses located out of the way of most daily traffic will find it harder to attract customers. This is usually due to the size of their building or the type of service. Roadside signs such as backlit or illuminated signs are essential to attracting customers from the get go. With installed lighting, your sign can advertise twice as much and improve your business. Banners are also an excellent idea since they are capable of being installed in many different areas around your building. Think big with your signs, and they will boost your business! Westmount Signs is well-known in the region for our extremely quick turnaround times for designs and the signage itself. Our team is personable and we are available to talk when you need us! Our products and services are all offered for great prices. We are also very active in our community and have contributed to providing stunning signage and prints for local festivals, events, charities, and businesses. We fully manage all the details so you don’t need to worry about anything. If you are interested in learning more about us or want to get started on a project, feel free to contact us! Westmount Signs is located in the K-W region and provides quality signage for business and recreation alike in the area. Exterior signage, while the most popular, is not our only service! We also provide interior signs, digital printing, vehicle graphics and our own installation and maintenance service. We are dedicated to your needs and provide free mock-ups to ensure your satisfaction as well as free estimates to show you our incredible pricing. If you are interested in starting a project with us or would like to learn more, phone us at 519-885-1400 or email us at sales@westmountsigns.com. Kitchener business owners will know that every business needs store front signs. Storefront signs (or facial signs), are located on the frontal exterior of a building, these vital additions are instrumental in attracting customers. They often set the standard for all who enter your store, so it’s important to make sure your business has a sign that reflects your services and shows that you are the best choice. At Westmount Signs, we are no stranger to storefront signs and can help make your signage dream come true. If you are thinking of storefront signs or would like to learn more about our company, feel free to contact us! Take a look at our handy information on storefront sign below to see what they can do for your business! What Is a Storefront Sign? While there are several different types of exterior signs, storefront signs are a smaller fraction of the many different outdoor signage options. They consist of any sign that can be directly attached to your building’s exterior. Signs like individual cut letters, illuminated signs or channel letter signs are all great ways to get creative with fonts and colours to help attract customers. You can opt for a more structured look by using illuminated or backlit signs to create a solid surface or add a minimalist look using just individual cut letters which can be installed with LED lights for added visibility. Since they are attached to your building, storefront signs are the perfect opportunity to immediately announce your presence to potential customers. Click here to read about choosing the right sign for your building exterior or click here to see our other exterior signage options. Storefront signs are a great way of communicating to your potential customers. They help create a more direct relationship to your customers and make their decision to use your services or buy your products that much easier. Not only that, they make your store stand out from others in the area, and are also a necessary way to make it easier for others to locate your business. If you are thinking about signage, we recommend installing a storefront sign as your first step to mark your building as your own and attract business. With so many businesses in Kitchener providing citizens with every kind of service and product, you need to know what will help your business succeed. No surprise, the answer is storefront signs. This may mean upgrading an old sign to suit new needs or maybe you may be looking at storefront signs for the first time. In Kitchener, revamping the old and creating new and beautiful designs is very popular right now, so it would be a good idea to consider doing the same to your potentially old storefront sign. Whatever your situation, Westmount Signs can help! -A property business in Waterloo. Click here to see more about what our customers think about us! Westmount Signs is located in the Kitchener-Waterloo region and has provided countless quality signs to residents in and around the area. We are always ready to help anyone’s signage dreams become a reality with great prices, personable staff and quick turnaround times. We also offer free mockups for potential customers to ensure all our customers are 100% satisfied. While we do exterior signs, we also offer interior signs, digital printing, vehicle graphics and our own installation and maintenance services. If you would like to get started on a project with us, feel free to call 519-885-1400 or email us at sales@westmountsigns.com.